Pedal-boards for teacher & student! I understand the importance of the environment in which we learn. With that in mind, I have set out to create the best, most conducive teaching atmosphere possible. Below are the reasons why I feel as though I offer the best teaching room in OC. Location: Centrally located in South Orange County with easy access to the 5 freeway and Crown Valley Parkway. Close to Costco and the Mission Viejo Mall for those that want to be able to shop during or after their/child's lesson. The 3 Flags Center is a nice, clean well kept center with plenty of parking as well as a variety of shops within immediate walking distance of my studio. These include a hobby shop, a karate studio, and a dance studio. A comfortable lobby with a clean, private restroom. Guest wi-fi access in the lobby to work or surf the net for the duration of the lesson. Not a private residence or loud music store. 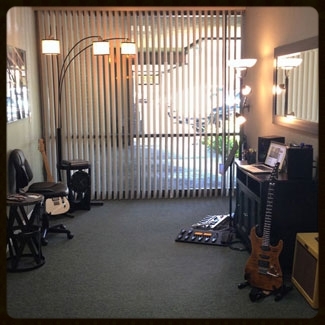 No other teachers or lessons in my studio, eliminating the distraction of hearing others practice like in music stores or other teaching facilites. Can accommodate more than one student at a time. Exclusively private and by appointment only. Serving San Clemente, Dana Point, Laguna Niguel, San Juan Capistrano, Mission Viejo, Aliso Viejo, Laguna Hills, El Toro, Rancho Santa Margarita, Laguna Beach, Irvine, Newport Beach, Corona Del Mar, Tustin.